I went out to Treasure Island on Monday after work. I went to meet my friend Sidney, who was photographing the installation of a Burning Man sculpture on the Island. Entitled Bliss Dancing, she is a beautiful example of Black Rock art. Humanist, gargantuan, and incredibly beautiful, Bliss danced on the playa, and now dances on the edge of Treasure Island. While there I also shot the construction of the new eastern span of the Bay Bridge, featuring the world’s largest self-anchored suspension tower. 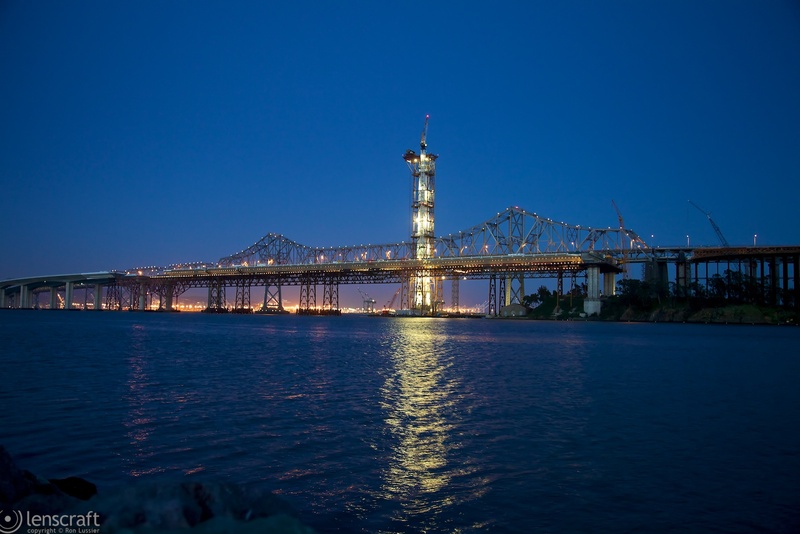 It’s 525 feet high (160m), roughly the same height as the west span towers. When the cables are hung and lit, I expect it will be gorgeous. This entry was posted in north america and tagged california, san francisco, united states. Bookmark the permalink. The dancer is eerie… I’m trying to figure out if she is an installation or a real person. BTW, when you had Treasure Island on the title, I thought you meant the casino.